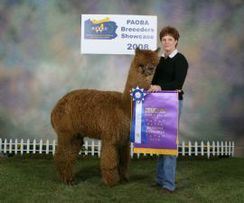 BIG NEWS: VIKING's first female cria to hit the showring takes 1ST at MAPACA 2010!!! Way to go VIKING!! MORE BIG NEWS: VIKING's fleece places 1ST MAPACA 2010!! Cheryl Gehly remarks on VIKING's fineness, uniformity and character especially for a breeding male of his age!! After just starting his breeding career, 3 breedings already confirmed. Looking for an up and coming herdsire to spark your breeding program-- look no further VIKING can take your program to the next level. 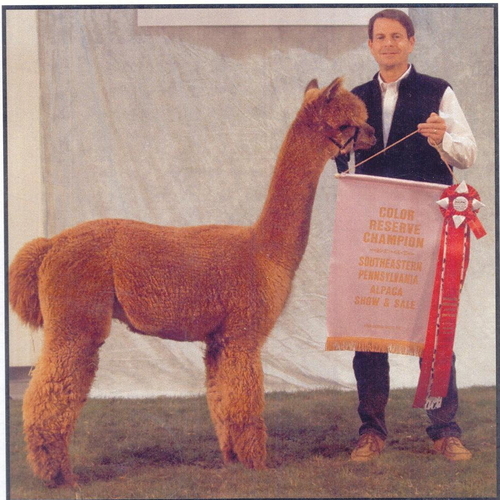 Proven in the showring and now proven himself as a potent breeder. Nows your chance to get in on the action!! VIKING'S show record leaves you with no questions. Multiple 1st and championships, plus a 1st at the AFCNA Continental Fleece Show and COLOR CHAMPIONSHIP at the AOBA Nationals. We can't wait to get him working!! Perfect conformation coupled with amazing fleece make this VIKING a proud new member of our herdsire row. 30 day free board included with all purchases, after 30 days $3.50 a day board for all animals over 8 months of age.